In Sweden we have this popular dessert called After Eight pears. It consists of canned pear halves that you top with an After Eight each, bake them in the oven or put them in the microwave until the chocolate on top is slightly melted and then eat with ice cream. It’s a little bit like a cheaty version of Poire belle Hélène. It sounds like a strange combination but pears, mint and chocolate goes nicely together. After Eight pears is the type of dessert that you can just whip up impulsively in five minutes, but the After Eight makes people think it’s fancy. I wanted to make a similar dessert but of a better quality, something you can feel that you made yourself from scratch rather than just putting half made things out of packets together so I decided to poach some pears and make a chocolate-mint sauce to go with it. I think the result is a lot prettier than the good old After Eight pears. I don’t think it needs anything to go with it but if you want to then you can have it with some vanilla ice cream or some whipped cream. You want to be careful with how much mint oil you put in the sauce, it can easily overpower the gentle flavour of the pears. Peel the pears but leave the stalk on. Put the sugar and the water in a sauce pan and stir until the sugar is dissolved. Put the pears in the water and let them simmer until they are soft, about 10 to 15 minutes. Put all the ingredients in a sauce pan and whisk until it starts to boil, over a low heat let the chocolate sauce gently boil for about 5 minutes until the sauce is shiny and thick. This entry was posted in Other desserts and tagged After Eight pears, chocolate, chocolate sauce, mint, pears, poached pears. Bookmark the permalink. 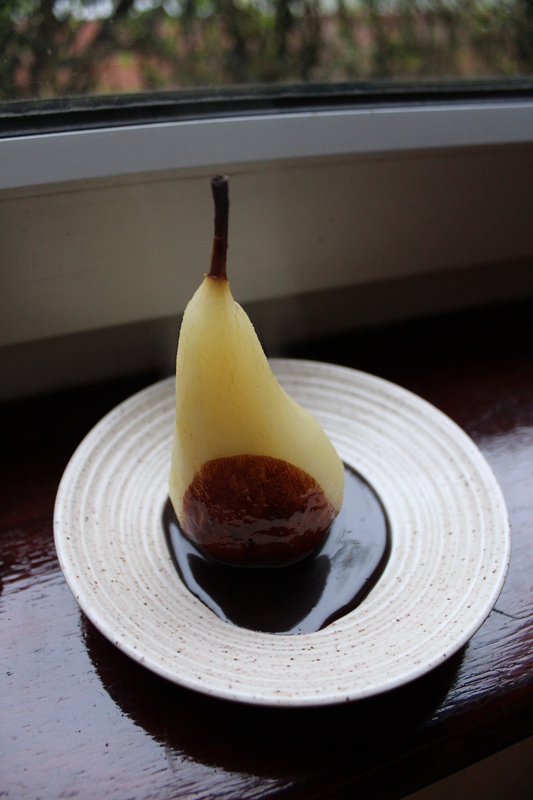 Ohh, poached pears are so delicious! My grandma used to make ginger poached pears when I was little, if you haven’t tried them that way I really recommend it! I’ve never heard of melting After Eight on top, but it sounds really good. I definitely have to try this! They are, they always look so pretty too! Never tried ginger poached pears but it does sound like the ginger would go nicely with the pears. What do you eat them with? We usually just had a dollop of whipped cream with them, but I’m sure vanilla ice cream would work too! Ah, whipped cream and vanilla ice cream seems to work with everything! Keith (my boyfriend) teases me about it because everytime he has dessert I seem to say “some cream would be nice with that you know”.